Krishna Prem will visit the Druivenkas to give a Meditation & Playworkshop together with Nigam. 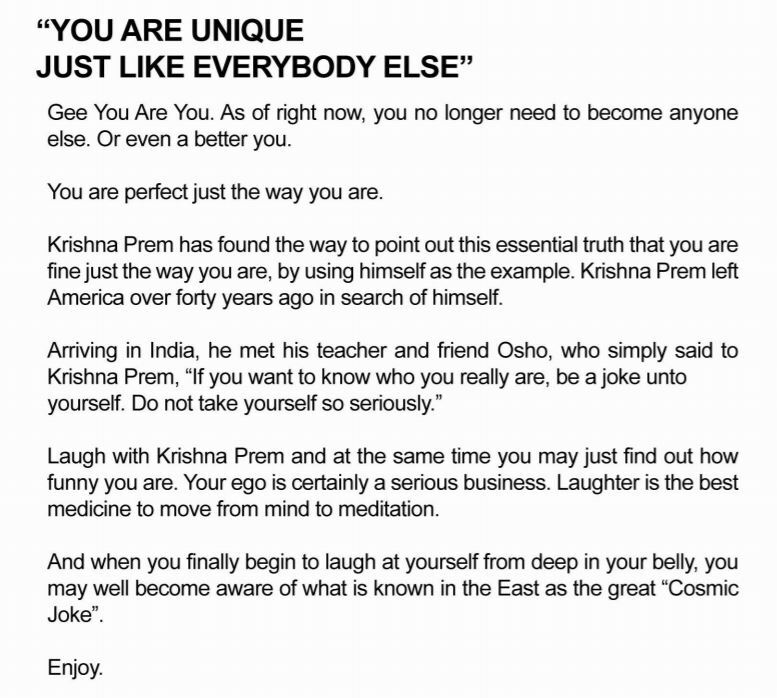 Including in this evening is Krishna Prem’s book “Gee you Are You. Find below a little more background and the link to the first chapter of this book. Are you curious about meditating in a playful way? Stillnessinyoga offers a meditation workshop on March 30th from 18.00 – 21.00 in Doorn. Join Krishna Prem and Nigam in a delightful evening of Meditation and Celebration where you are lead from a playful meditation into the beautiful silence. Join in an evening of meditation and cosmic gossip with Krishna Prem. As well as chanting and celebration with Nigam. We will explore together the mysteries of life, love and meditation. Love is the feminine way to enlightenment and meditation is the masculine way. Krishna Prem, also known as Michael Mogul, is an author of “Gee You Are You” as well as being a meditation teacher. Krishna Prem left America over forty years ago in search of himself. Arriving in India, he met his teacher and friend Osho, who simply said: “If you really want to know who you are, be a joke unto yourself. Do not take yourself so seriously.” For more information on Krishna Prem check www.geeyouareyou.com We are happy that Krishna Prem will co-host this beautiful evening with us. The evening cost 35 euros and includes a free copy of Krishna Prem’s book Gee you Are You. Location The Druivenkas at Bartimeus Historische Moestuin, Doorn. Address Driebergsestraatweg 44, 3941 ZX, at Doorn.